The Seaward exhaust systems will be the biggest market changing product to debut in 2016. These exhaust systems were not only created using the most modern robotic electronic machine operations but with state of the art tooling. What does all of this mean? It means you can now buy the very best reliable performance exhaust manifold system that money can buy for a whole lot less money. The SEAWARD debut is a 100% all new design these exhaust systems were built to provide virtually every feature once desired in a performance marine exhaust system with reliability and longevity being the key features. 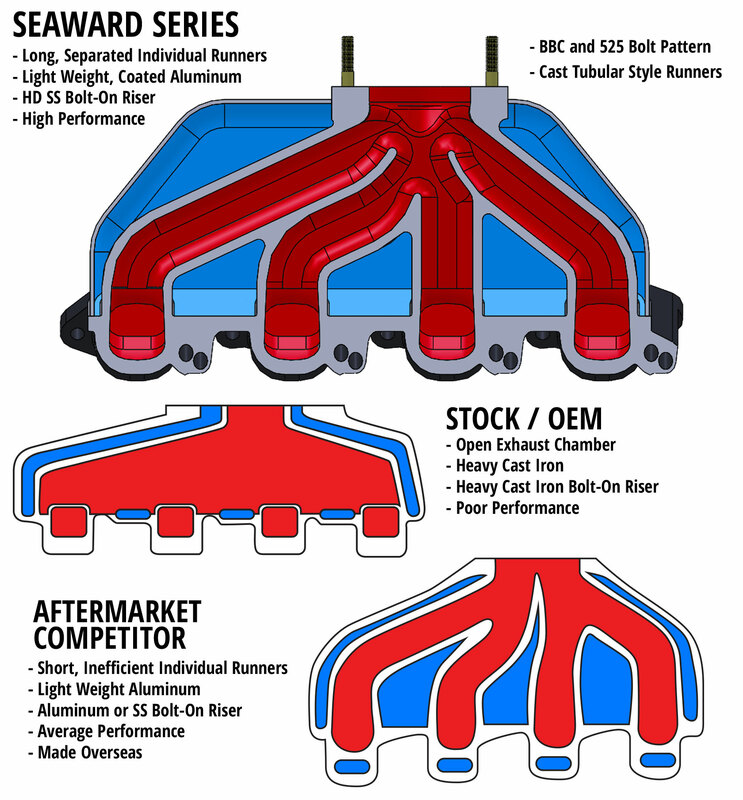 Here's the facts: There is no other performance exhaust manifold system on the market today that with as many features and advancements in construction PERIOD. Starting with a 356T Heat treated tubular style cast internal core that has been optimized to flow with the technology design and shape and design of a tubular header. By extending the runners and separating the exhaust pulses to the collector this system produces maximum power in a compact design. More Facts: 1000 hour salt spray coating. That's right this industry has never seen these types of processes. These products are extending the naval and aerospace program products as much as ten years. Sure the finish is that of a show piece, but it's truly what you can't see that sets these systems apart. Underneath the thick non-porous billet heat treated aluminum casing lies the most exceptional foundation of corrosion protection found anywhere. A hydrogen infused zinc process is applied to each manifold. Until now salt spray testing could merely only withstand 100-150 hours of sustained exposure, Today those numbers are 1000 hours of durability. More facts: Beauty is well beyond skin deep here as the beautifully polished stainless steel exhaust risers of the systems are manufactured from 316L Stainless Steel while inferior systems choose inferior stainless (303/304 Auto Grade) steel, Seaward systems offer nothing but the best money can buy which has been proven to be the most durable long lasting product for marine use. Hardin Marine Innovates yet again and takes the performance marine exhaust world by storm. That's a FACT as Hardin releases the very first and ONLY DIRECT BOLT-ON (no drilling, no tapping required) for the Mercury Racing's popular 525EFI engines. Until now the industry was plagued with poor quality OEM factory tubular headers know to fail early or expensive tubular stainless replacements. Note: All 525EFI Seaward applications use a 4" intermediate tailpipe section and NOW all 600/700SCI engines will use a 4-1/2" intermediate tailpipe. 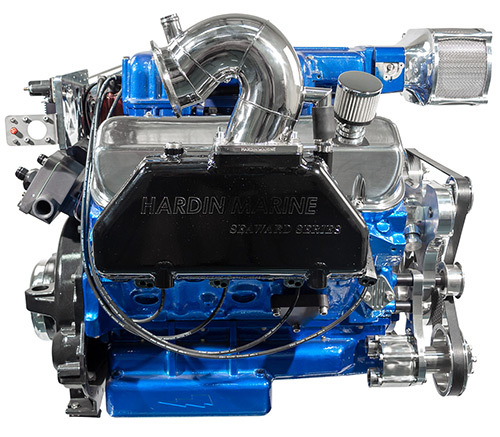 With a loud outspoken cry from the boating community for a reliable , powerful, cost effective option the folks at Hardin set out to build not only the perfect exhaust system but a system around their new SEAWARD exhaust that would easily retro-fit the OEM headers. The new Seaward System bears all of the superior quality's of their standard seaward system with the addition of a companion tailpipe allowing the connection of the factory tailpipe already in use. This is the perfect solution for engines equipped with silent choice or custom tailpipes as the user can still retain those. each kit comes complete with all necessary hardware for a complete installation. You Save: 7% off MSRP! Don't Forget These Essential Items! The big-block Chevrolet has a firing order of 1-8-4-3-6-5-7-2. This means that In each exhaust manifold, we will have two cylinders that will fire In succession. Cylinders 8 & 4 on the starboard side manifold and cylinders 5 & 7 on the port side manifold. In the images of the competitor exhausts below, we can see the manifold has a divider that separates the exhaust pulses from cylinders 8 & 4. This divider keeps the exhaust gases of the number 4 cylinder from entering the number 8 cylinder when the number 8 exhaust valve Is still open. The port manifold actually groups cylinders 5 & 7 together. Without a divider between these two cylinders, the exhaust gases from the number 7 cylinder will enter the number 5 cylinder when the number 5 exhaust valve Is still open. This Is not what we want. Using this style manifold on both sides of a V8 engine Is not very efficient. As shown on the Seaward manifold however, all ports are truly separated, leading to better exhaust performance. A new Performance exhaust manifold and risers can provide feel of a noticeable improvement in the motors breathing much better as the engine(s) respond quicker to the throttle input, The risers stay significantly cooler vs the OEM risers it, and the water cooling temp is lower than before. The combination of less weight on the rear transom area of the boat, with a faster response time to throttle input, quicker gas exhaust exit from the system and a cooler running system makes the boat perform better than before out of the hole and get quicker to chosen speed at all RPM ranges. A very slight louder exhaust is only noticeable when flushing the engines out of the water, and a very slight deeper sound (more bass to it) exhaust under the water.